Join us Saturday, May 25th for Cruisin' for Critters 2019. With your support, these animals will receive the care they need and help find them forever homes. All motorcycle enthusiasts welcome. Don't have a bike? Join us in your car! Registered Volunteers are welcome to help at this event. Please contact Dana to sign up! We are currently finalizing our 2019 route. We will include a map and all route stops when finalized. 1 registration fee covers 1 person. If you are filling out the physical form, you must fill out 1 form PER person. Do I have to have a motorcycle? No. You do not have to have a motorcycle to participate in the event. Everyone is welcome! When does pre-registration pricing end? Pre-registration pricing ends online at 2pm on Friday, 5/24. You may register in-person at the shelter or at Bike Night at J&L Harley on Friday. Can I pay with a card the day of the event? Cash, check or card is accepted for registration the day of the event. 50/50 drawing is cash only. How much are tickets for the 50/50 drawing? Tickets will be available at 3 tickets for $5, 10 tickets for $10, or an arm span (fingertip to fingertip) for $20. 50/50 drawing is cash only. Check-in is from 11am - 1pm at J&L Harley Davidson. Do I need to check-in at J&L or can I just start riding? You must check-in the day of the event at J&L Harley Davidson. You will pick up your t-shirt, rider packet and sign the waiver (if you did not previously do so) before you start your ride. Your packet will include a map and list of prizes, as well as a few other goodies! Will there be a shot-gun start? No. 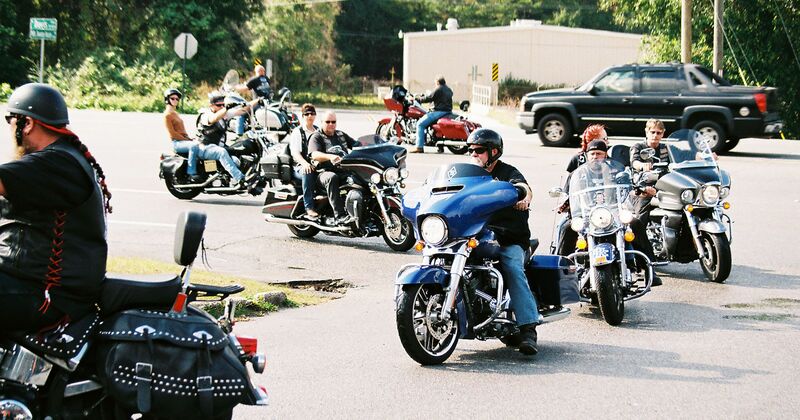 As soon as you are checked in you are welcome to hang around at J&L Harley Davidson or take off and start your ride. The route map is listed above on this page and you can download it above. Route maps will also be available the day of the event. Do we have to ride the route given to us? No, you do not have to ride the route exactly as it is planned, or in the order given. The only requirement is that you end at Fresh Horses Saloon in Harrisburg. If you wish to qualify for prizes, you must have stopped at each location and gotten a mark on your card. Do we have to stop at every stop listed? If you wish to qualify for prizes at the final stop, yes, You must stop at at least 5 of the 6 bar stops listed in order to qualify for prizes. If you don't wish to qualify for prizes, you may just join in the fun and have a great ride while helping the animals at the SFAHS. End time varies on when the majority of riders come in to the last stop. The prizes will be awarded between 5pm-5:30pm, as it is currently planned. Yes, you must be present to win. If you cannot take your prizes with you that night, you can arrange a pick-up at the shelter at a later date with Allison, the Special Events Coordinator. What poker hands will win prizes? Prizes will be awarded for Best Hand, Worst Hand, Most Kings, Most Queens and Most Jacks. There are also prizes for Youngest Rider and Farthest Distance.